Learn more about our available storage and support offerings through Ubuntu Advantage. Practically every organisation today is faced with dramatic growth in storage, and this has driven the expense of deploying, managing and growing storage infrastructure to critical levels in the IT budget. Traditionally, enterprise storage has been the domain of appliance-based solutions with SAN (Storage Area Network) and NAS (Network Attached Storage) technologies being the standard way of deploying petabyte-scale managed storage. However, they are expensive and based almost completely on proprietary technology, which often leads to reduced flexibility and costly expansion and upgrades. The modern way of addressing large-scale storage requirements in the most cost-effective manner is with software-defined storage (SDS), which can be deployed entirely on commodity hardware. Ubuntu Advantage Storage is a new line of solutions from Canonical which embed SDS technologies in comprehensive, fully supported storage software services. Designed from the ground up for petabyte-scale deployments backing cloud, web-scale and back-office applications, Ubuntu Advantage Storage offers a choice of technologies at the best cost per GB on the market. Enterprise storage solutions are typically priced either per-node or according to the total disk capacity deployed. This leads to an obvious cost penalty for good practices such as replication and advance build-out of capacity. Ubuntu Advantage Storage is different. 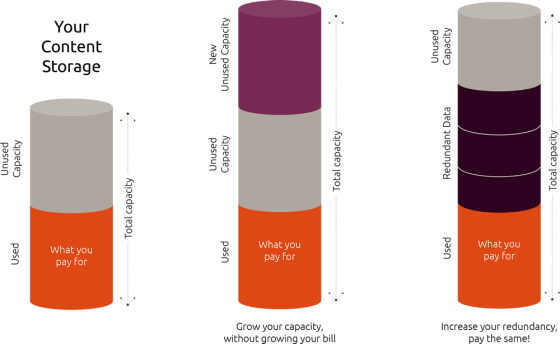 Our pricing is based on the amount of data you have recorded in your storage pool, regardless of how much disk space is utilised to durably record it. You don’t pay for replicas, and you don’t pay for empty space — just like you would expect from a modern public cloud storage service. Popular object storage system known to scale to over a hundred petabytes at sites like Rackspace, Internap and the San Diego Supercomputing Center (SDSC). With eventual-consistency replication model suitable for multi-site, multi-zone replication and complete, native OpenStack integration with Keystone V3 authentication. Converged storage platform offering fully supported object and block filesystem interfaces. It is known to scale to dozens of petabytes at sites like CERN, Yahoo and Deutsche Telekom with a strong-consistency model can directly replace SAN and NAS appliance functionality.